NHL prospect Connor McDavid has drawn comparisons to the great Wayne Gretzky, Sidney Crosby and even been called “The LeBron of Hockey”. All of 18 years old, he’s expected to be the #1 overall pick by the Edmonton Oilers in the 2015 NHL Draft. Now fans will be able to meet Connor at an upcoming signing appearance in Ontario on June 13th brought to you by one of Canada’s leading sports memorabilia company, A.J. Sports World. Connor represented Canada in the 2015 World Junior Championship in Toronto and Montreal where they won gold on January 5, 2015. He served as one of the two alternate captains for the team. 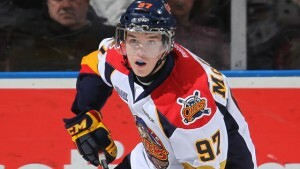 In the 7 games McDavid played at the tournament he scored 3 goals and a tournament-leading 8 assists. He was named to the tournament all-star team and already scored endorsements from Reeebok / CCM and leading sports nutritional company, BioSteel. This is one of the first chances for fans to meet Connor and get an autograph at A.J. Sports World. Connor will be signing in store Saturday June 13, 2015 between 4:00PM and 5:00PM at 2720 Steeles Ave. West, Suite # 1 in Vaughan, Ontario. Tickets will be available for purchase on their website until 48 hours prior to the event. Tickets will be also be available for purchase at our store on the day of the event. For more information, fans can visit www.AJSportsWorld.com. If your company is interested in hiring Connor McDavid for an appearance or endorsement, contact AthletePromotions.